Pradeep Nerurkar was born in 1957 in Mumbai. He studied under the guidance of Late G. S. Haldankar and Late Shankar Palshikar and received his Diploma in Fine Art from Sir J. J. School of Art, Mumbai. In 1997 and 1999 he participated in the Annual Show of Bombay Art Society at Jehangir Art Gallery, Mumbai. In 1998 and 2006 he had solo exhibitions at Jehangir Art Gallery, Mumbai. In 2000 Pradeep participated in ‘Art and Personality Camp’ of Bombay Art Society and in ‘4 Days For You’ (Artists Camp) at Arnala in Mumbai. In 2001 he participated in an interactive workshop in Mumbai. In 2002 he took part in the ‘Golden Jubilee Show’ at Jehangir Art Gallery, Mumbai. In 2003 he had a solo exhibition at Archer Art Gallery, Ahmedabad. In 2004 he participated in the 46th National Exhibition of Arts at Lalit Kala Academy, Kochi. In 2013 he participated in ‘Silent Windows’; in 2014 he participated in ‘Meher – Art with a Heart’ and in 2015 he took part in ‘Silent Windows II’ at Gallery 7, Kalaghoda in Mumbai. In 2016 he had a solo exhibition ‘Seeing is Muting’ at Gallery 7, Kalaghoda in Mumbai. 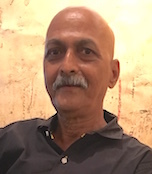 Pradeep passed away in 2016 in Mumbai. Pradeep received many awards: In 2002 Pradeep won an award from Bombay Art Society at Jehangir Art Gallery, Mumbai. In 2003 he won an award at the 43rd Maharashtra State Art Exhibition in Mumbai. In 2017 he was posthumously honored with the Krutadnyata Sanman by the Bombay Art Society at Jehangir Art Gallery, Mumbai.